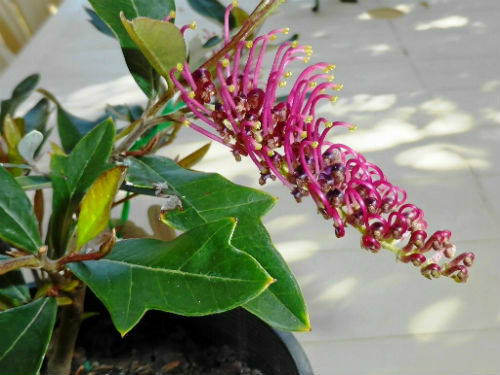 Australian Plants Society NSW - Grevillea "Bedspread"
Grevillea “Bedspread” is a hybrid whose parents are said to be G. “Royal Mantle” and G. wilkinsonii, a rare species from southern NSW. G. “Bedspread” is a dense ground cover with a spread of at least two metres. Dark green leaves are ten centimetres long by five centimetres wide. Leaves have serrated margins. Toothbrush-shaped flowers are dark red and appear from spring to autumn. They are rich in nectar and attract honeyeaters. “Bedspread” could be grown under other plants as colourful living mulch or allowed to spill over walls and embankments. Tip prune to maintain foliage density. “Bedspread” is grown on embankments around Parliament House in Canberra. This free-flowering ground cover is similar, in appearance, to G. “Fanfare”, G. “Royal Mantle” and G. gaudichaudii.